Wild Ideas, Inc. has announced the launch of their first Kickstarter project to fund the production of Clown in the Closet, a Halloween-themed parody of the popular Elf on the Shelf Christmas doll. 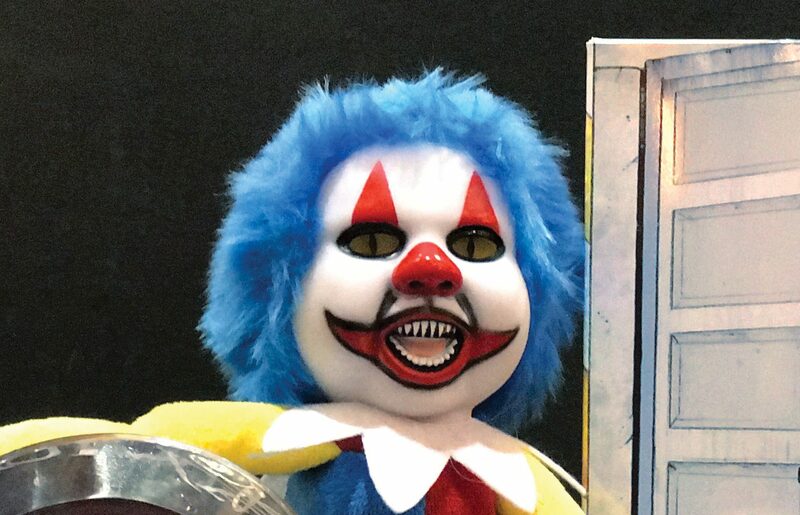 From the official press release: The Clown in the Closet is a 14-inch plush doll featuring flashing eyes and a sinister laugh triggered by a light-sensitive photocell. He is designed to be hidden anywhere it is dark – closet, cupboard, drawer, etc. – then startles the next person to find him with flashes of light and a scary laugh. That person then hides the Clown in a new location and the game continues. “As I saw how elaborate some people were getting with the Christmas elf,” said Clown creator Scott Lipsett, “I thought, ‘Halloween needs something like this’.” Realizing that fear of clowns is quite common, the Clown in the Closet™ concept was born. Lipsett hopes people will turn this into a new Halloween tradition, to start hiding the Clown on October 1 and finishing on Halloween. The company’s soon-to-be-launched website will encourage Clown owners to share their most creative ideas and best scares. The doll itself is powered by two AAA batteries and features a molded plastic head with flashing LEDs behind its eyes. The seat area is flat and weighted for easy sitting poses, and hook and loop pads are attached to the hands and feet, creating a myriad of possibilities for hanging, posing and even attaching other objects to the Clown. The Kickstarter project is live now with a modest $45,000 funding goal to finance an initial production run. You can find it at closetclowns.com. If all goes well, the company expects Clowns to be available for this Halloween. Wild Ideas, Inc. was founded to bring unique consumer products to market, and is the General Partner of the popular Reactor Watch company. The team has extensive experience in manufacturing and launching new concepts. Clown in the Closet™ represents their first foray into both the toy and holiday categories. Elf on the Shelf® is a registered trademark of CCA&B LLC and is not affiliated with Clown in the Closet™ or Wild Ideas, Inc.